The Proto-Beaker package probably emerged in a south-western Iberian region, part of the southern and west-central Iberia that participated in the evolution to complex, huge fortified settlement sites like Los Millares (Figure 40) and Zambujal, and other even larger macro-villages. The regions around the lower and upper Guadiana and the upper Guadalquivir rivers stand out as two of the most densely settled territories in Iberia, probably related to their agricultural potential and their rich copper ore deposits. Macro-villages in this region extend over more than 100 ha (Heyd 2013). Figure 40. Painting of Copper Age walled settlement of Los Millares, by Miguel Salvatierra Cuenca. Photography by Jose Mª Yuste. From Wikipedia. This local development must be discussed in light of the “Transformation of Europe”, the demographic, cultural, and economic pressure brought about by western Yamna migrants disturbing the equilibrium in central Europe. However, another often discussed influence are the contacts with Early Bronze Age cultures from the Aegean, and probably also the Levant. This east–west Mediterranean connection is evidenced for example by the exchange and use of ivory (Heyd 2013). The dimensions of the settlement complexes are therefore essentially an expression of the available work force and agricultural wealth of these societies, as well as of the demographic increase observed during the 3rd millennium, all consequence of the new exceedingly productive subsistence strategies. Most Iberian Copper Age communities of any size and geographic location expressed a strong preference for communal values, as shown by collective burial practices and communal organisation of part of the economic production, such as open spaces dedicated to storage pits, specialised metalworking areas, grinding equipment, flint knapping traces, etc. (Risch et al. 2015). Their connection is also seen in a common universe of decorative motifs, signs, and symbolically meaningful artefacts, apart from the sharing of long distance networks, evidenced by metalworking technology, flint artefacts, and the use of raw materials such as ivory (Risch et al. 2015). 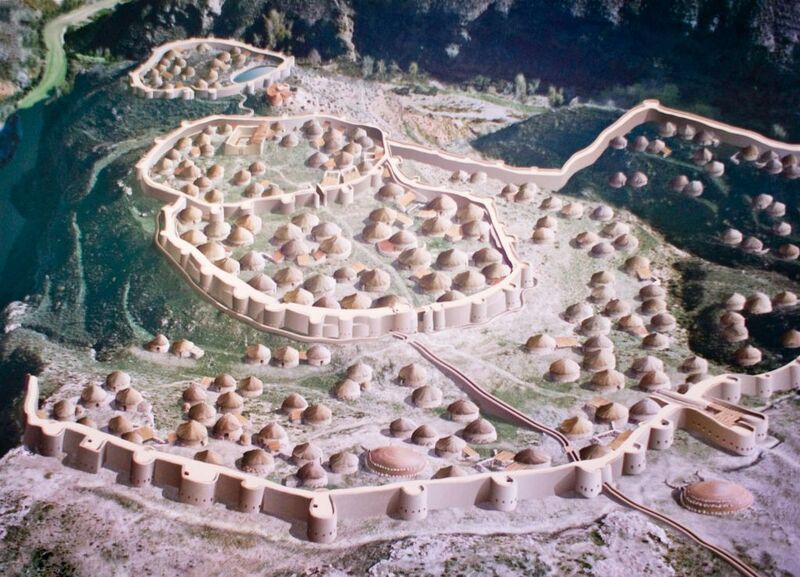 Ditched enclosures and fortified settlements coexisted and were thus probably specialised in their economic practices. Both types of settlements were associated with megalithic tombs or subterranean grave structures in the immediate vicinity, hypogea, and large pits, with deceased of all ages and sexes buried there over generations. Tholoi and natural caves were also used during this time, with differences in funerary rites not representing apparently unsurmountable cultural barriers (Risch et al. 2015). Nevertheless, the Iberian Copper Age was essentially dominated by a rather mobile residential pattern, with unfortified occupations, often less than 0.5 ha, found in very different topographical positions. Basic features of the subsistence economy include intensive agriculture on the most fertile or humid soils, but also a firmly established husbandry (with milk and wool as by-products), with hunting, gathering and fishing providing important complementary resources. Many of these smaller settlements were probably dependent agricultural communities, compelled to pay tribute to the larger, more complex settlements (Risch et al. 2015). These Chalcolithic societies thrived in the Final Neolithic–Chalcolithic period, with small and short-lived chiefdoms, transegalitarian and hierarchical polities. The demographic density increased during the pre-Beaker period in the Meseta and in the south-east, peaking during the initial Beaker phase, while the south-western region shows a more discrete growth peaking during the pre-Beaker phase and dropping abruptly ca. 2500 BC, just prior to the Beaker period (Blanco-González et al. 2018). The introduction of Bell Beaker pottery ca. 2600/2500 BC, quickly expanded through the Atlantic coast, shows a variable importance in the rest of Iberia. In the area of Los Millares, it appears only in certain settlements, while in the south-west Bell Beakers are rare when not completely absent. Furthermore, there is no clear correlation with specific types of habitation, funerary structures, or with metal production (Blanco-González et al. 2018). The EBA shows changes in south-eastern Spain partially synchronic with those in Italy and the Balkans ca. 23rd/22nd century BC, marking a profound social, political, and ideological evolution. A substantial number of 14C dates confirms that most, if not all, of the Chalcolithic fortified settlements and Late Neolithic–Chalcolithic monumental ditched enclosures had been abandoned by 2200 BC (Blanco-González et al. 2018). The older networks of symbolical axes made of exotic rocks, flint, ivory and decorated schist plaques, Bell Beaker pottery, etc. collapsed rather abruptly or was reorganised at a much more local scale. In the funerary sphere, this date marks the abandonment of a collective burial rite. However, while the Atlantic coast shows an abrupt de-intensification of human pressure, the central and eastern Iberian regions do not show these fluctuations (Blanco-González et al. 2018). Intensified contacts during the Final Neolithic–Chalcolithic in Iberia–southern France, including common social and economic developments, with the newly created exchange networks and the demographic expansion, are potentially the mark of an expanding common ethnolinguistic community, which may be identified with an Ibero-Basque group (Villar Liébana 2014). Among the I2-M438 lineages, five I2a1b1b-Y6098 (formed ca. 6000 BC, TMRCA ca. 2900 BC), probably all I2a1b1b1-S23680/S23467 subclades (formed ca. 6000 BC, TMRCA ca. 5700 BC), appear in sites all over Iberia, suggesting a spread coinciding with the Neolithic expansion and later migrations (with one I2a1b1b-Y6098 sample in Corded Ware in Czechia). Divergent I2a1a2-M423 lineages appear in south-western Iberia, northern Iberia and southern France Megalithic, being a haplogroup widespread among central European hunter-gatherers and later farmer populations. One I2a1a1a1-Y3992 is reported from northern Iberia, a lineage shared with north Italian and Balkan Chalcolithic samples. There are also two samples G2a2b2b1a1a-PF3378 (formed ca. 6900 BC, TMRCA ca. 3800 BC) from El Mirador; two G2a2a-PF3147 lineages, one from central Iberia and one from north Iberia; and there are also one haplogroup F-M89 from the centre (also found during the Early Neolithic in the north-east), and two H2-P96 lineages from south-west and north Iberia. Contacts with Africa can be inferred from the presence of an outlier during the 3rd millennium BC, which shows ancestry compatible with a first-generation North African migrant (Reich 2019). If there was a Basque-Iberian language, it should be identified with Chalcolithic communities of Iberia and southern France before the East (or Classic) Bell Beaker expansion. The possibility of a Basque-Iberian language may be supported by the genetic homogeneity and continuity during the whole Neolithic period and during the Chalcolithic. Cultural expansions to the north (either with or without population movements), first with the Megalithic culture in the Middle Neolithic, and then with the Proto-Beaker package in the late Chalcolithic, may also be adduced to support this cultural unity. The language of this group should then be associated with the language of early Neolithic farmers, and thus possibly related to their expansion through the Mediterranean (Villar Liébana 2014). The fact that the ancestors of Basques and Iberians were isolated from each other in the Chalcolithic, after the arrival of East Bell Beakers, and were thus surrounded by Indo-European languages but still showed common linguistic traits in the Iron Age seems to support their ancient connection rather than recent areal contacts.